I did not return to Italy this summer, but Italy came to me and it took me around New England. I live in Connecticut, one of the most Italian states in the country, according to studies. Italian restaurants and Italian Americans are plentiful here, but Italian cars, not so much. A childhood friend of my cousins in the old country set out to try to change that. Sergio Marchionne, the head of Fiat Chrysler who died this summer, grew up in Chieti with a few of my Chiulli cugini (cousins.) During our big family reunion in Abruzzo I marveled over their Marchionne creations they drove on a daily basis, like my cousin Andrea’s Alfa Romeo station wagon and another cousin’s Lamborghini. Okay, it was a tractor, but nevertheless, these are not sold in the USA. My first trip to Italy in 1996, in between seeing the Vatican and the Coliseum, I found myself snapping photos of cars we didn’t see back home. Marchionne rescued Chrysler from a fate suffered by Studebaker, Oldsmobile and Packard and as part of the Fiat Chrysler deal, he decided to once again sell Alfa Romeo and Fiat models in United States. Maserati was already sold here, but the Marchionne plan was to expand its lineup by capitalizing on the SUV and crossover trend. This summer, when offered the chance to try out some of these new Italian models, I jumped. The first I tried out was the Alfa Romeo Stelvio, Alfa’s first crossover. Even though we have an Alfa dealer in Hartford, you’re more apt to see a bear crossing the street than a Stelvio at the stoplight. As you might expect, my test Alfa attracted plenty of stares and a few questions at stores and the gas station. It’s that emblem. The Alfa Romeo symbol is arguably the coolest out there. It’s colorful and that dragon snake creature is captivating. It is focal point of a very unique look that won’t be confused with other brands. The grill screams “I’m from Rome, Alfa’s ancestral home. Even the other names they use in their products are cool. Our tester was “Vesuvius” grey, after the volcano that destroyed Pompeii and looms over Naples and the Amalfi Coast. The kids also liked this ride so we put the Stelvio on our list of potential replacements when our lease is up in the spring. I like to drive cars that stand out just a little and the Alfa checks that box, and some others, too. The next Italian model did not make it to the family car list but rather the dream car list! This was a Maserati Turismo in “blu sofisticato.” It was love at first sight, and I happened to be wearing a coordinating suit the day I got it. I used it to attend the Ferrari Concorso in West Hartford to benefit Connecticut Children’s Medical Center, and it fit in nicely with its Italian brethren that were on parade and on display, including a small collection of Paganis that sell for more than $1M each. This Maserati was a relative bargain at only $132,000. No surprise here, this Maserati turned many a head. On the highway a group of high school age boys went nuts and took pictures with their phones as if they’d spotted Adam Levine or Odell Beckham. My son thought it was the coolest thing to get dropped off at school in an exotic sports car and I’ll admit the growl of the engine brought a broad grin to my face as well. Discrete, this car is not. Maserati is also up there in the logo department, which is handsomely stitched into the interior. Next up was Maserati’s new SUV, the Levante, which has some Jeep DNA in it, thanks to its American Chrysler cousin in Detroit. I was on vacation that week, so this Italian luxury workhorse got a workout. We drove from Connecticut to Rhode Island to Vermont to New Hampshire to Massachusetts then back to Rhody and Connecticut. From the mountains to the beaches we hauled kids and luggage, all the while getting queries from onlookers, who had heard of the legendary Maserati name, but never seen this model. 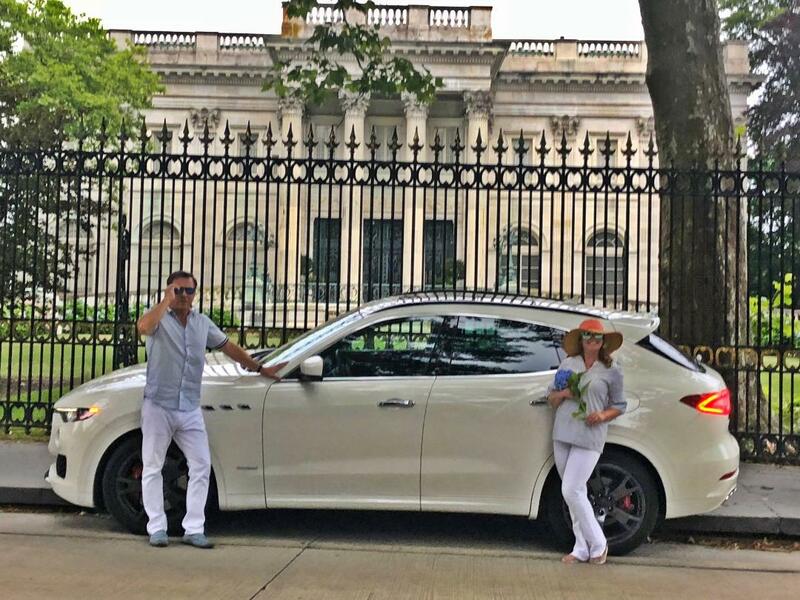 In hundreds of miles of driving, we never passed another Levante, even at home in Hartford, where we live three miles from a Maserati dealership. I’m not sure why I don’t see more of these Italian cars dotting the Connecticut landscape, after all this is considered to be an affluent state where BMWs, Cadillacs and Mercedes are fairly common. Just before Marchionne’s sudden death in August, he unveiled his strategy for Alfa and Maserati to target the “bored BMW” driver looking for something new. We loved the Levante, who wouldn’t, but the Alfa is more in our budget. I tend to be frugal when it comes to cars, and I would still take a $5000 used station wagon over a brand new $50,000 Lexus. Still, at $75,000 its comparable in price to a loaded Chevrolet Suburban or stripped down Cadillac Escalade, which granted are bigger and provide seating for 7 or 8 where the Levante is 5. It was a bargain compared to the $93,000 Lincoln Navigator I tested, but that’s a story for another day. Also tested a rare 1984 Chrysler LeBaron woody I spotted at Papa’s Dodge . Very cool. Wife hates it. Check it out in the slideshow below. For the record I have a few Buicks including my 22 year old Roadmaster Estate Wagon and a 12 year old BMW station wagon.